While painting this scene, I was reminded of an artist who had a booth next to mine at an outdoor art festival. 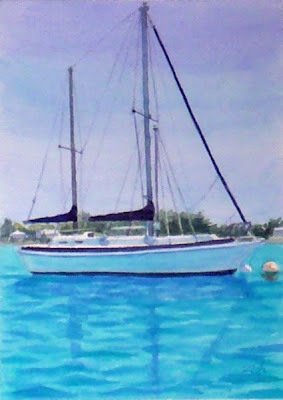 He told me he doesn't paint boats because he doesn't want to "string them." Well, I understand what he's talking about - this one has three masts and lots of "strings." However, in my paintings I am more interested in getting the feel of a scene than in painting every detail. And this one is no exception. So, please forgive if I've missed a "string" or two! I think I've captured the beautiful clear turquoise waters of Bermuda and the stately bearing of the ship.